Bazaarvoice is a network that connects brands and retailers to the authentic voices of people where they shop. Using their technology Bazaarvoice essentially highlight reviews in places that are most likely to influence customers’ purchasing decisions. This technology provides marketers with the opportunity to create a more engaging experience by driving brand awareness, increasing purchasing decisions as well as increasing sales and loyalty. BazaarVoice partnered with SaleCycle to highlight genuine reviews for their client’s products. 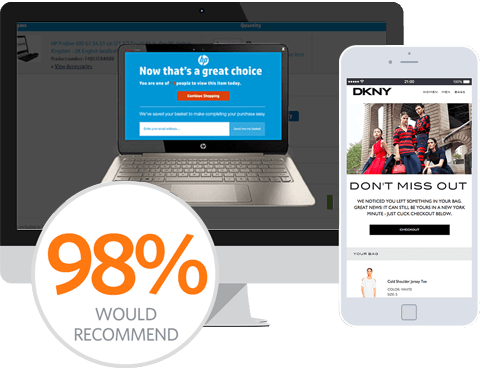 SaleCycle’s ability to deliver relevant messaging teamed up with Bazaarvoice’s authentic shopper-generated reviews makes for a perfect match to influence customers on their journey. With a quick and easy integration, SaleCycle are able to pull in both latest product review and the overall rating for abandoned products into an abandonment email. Bazaarvoice’s cleverly built technology ensures reviews are displayed appropriately to match each product, whilst highlighting the products as they are. We are all guilty of looking for a second opinion before making a purchase aren’t we? Our partnership with Bazaarvoice has given SaleCycle the opportunity to enable customers to do exactly this within a handy email. By putting authentic reviews directly in front of the customers throughout their decision-making process, SaleCycle’s partnership with Bazaarvoice has added to customer experience whilst also increasing conversion rates.